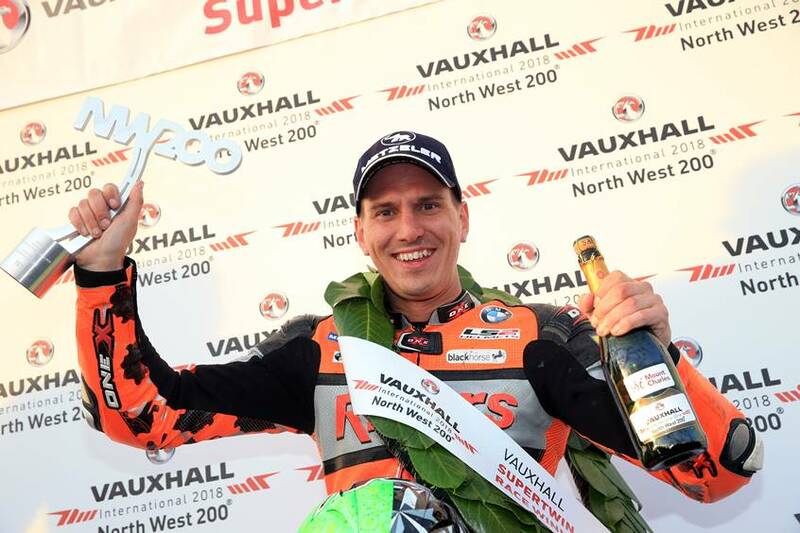 An exciting evening of elbow to elbow racing at the 2018 Vauxhall International North West 200 produced three different winners from the trio of Supersport, Superstock and Supertwins races. 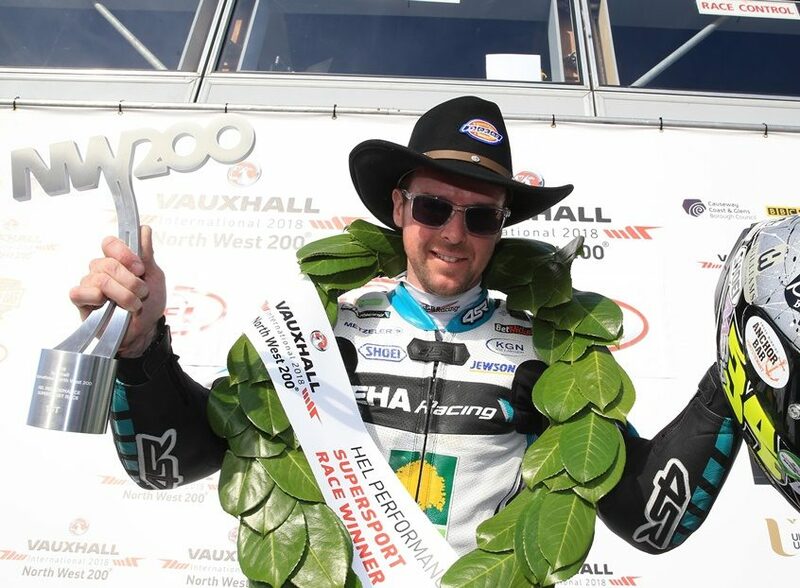 Alastair Seeley notched up his 22nd North West victory by winning the opening Supersport event on the EHA Yamaha after a battle with James Hillier (Quattro Plant Kawasaki) and Lee Johnston (Padgett’s Honda). Seeley’s winning margin was 2.4 seconds to maintain his record of having won a race at the North coast event every year since 2008. “It’s nice to keep that record going.” the 38 year old smiled. 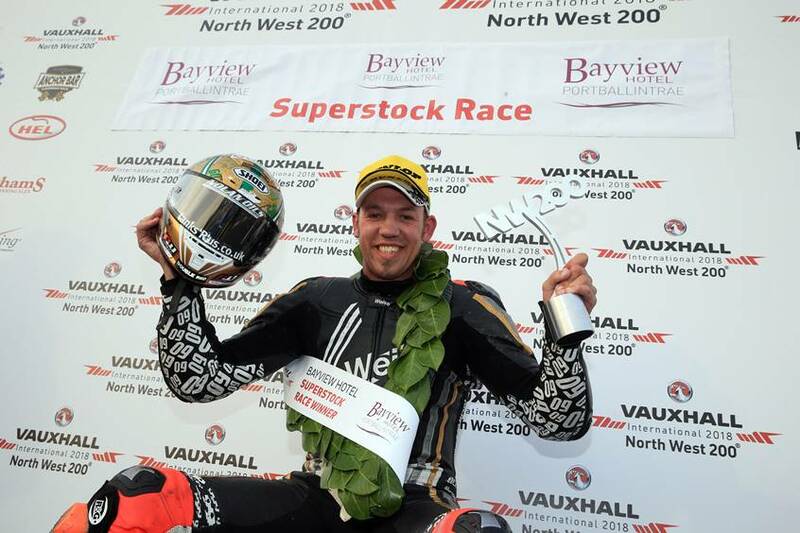 When Seeley moved into the lead of the Superstock race on lap three it looked like the Carrickfergus man was going to make it a double but it was Peter Hickman who snatched the chequered flag with a stunning last lap move. Hickman dived inside Seeley on the brakes going into Juniper chicane to give the big Burton on Trent rider his first North West victory on the Smith’s BMW. “It was really close on the lap before and I knew I could have a go there.” the BSB star explained. The race was a BMW benefit with Hickman winning by half a second from Seeley’s Tyco BMW with Michael Dunlop a further 0.5 seconds behind on his MD Racing BMW. Veteran Michael Rutter closed on the leading trio on the final lap to claim fourth place. “It was tight and I thought I had him.” Seeley said after the exciting tussle. The Supertwins race was another intense battle with Martin Jessopp eventually taking his third North West victory on the Riders Motorcycles Kawasaki. The Yeovil rider beat 54 year old former MotoGP star, Jeremy McWilliams (KMR Kawasaki) by 1.8 seconds with the youngest rider in the field, Joey Thompson finishing third on a Paton. “The evening had started off well when I was leading the Supersport race and then I ended up sitting on top of the Mill Road roundabout!” Jessopp joked about his earlier mishap in the Supersport race. McWilliams had led on the opening lap before grabbing second on his Ryan Farquhar prepared Kawasaki. “I fell asleep a little bit and I couldn’t work out where they were faster” the former Grand Prix and North West winner said. Racing resumes at the North West 200 with five races on Saturday. Roads close at 9.15am with the first race starting at 10am. Peter Hickman (60) celebrates his first ever North West 200 winthis during this evenings Superstock race in the Vauxhall International North West 200.